into an animation with CrazyTalk Animator 3. 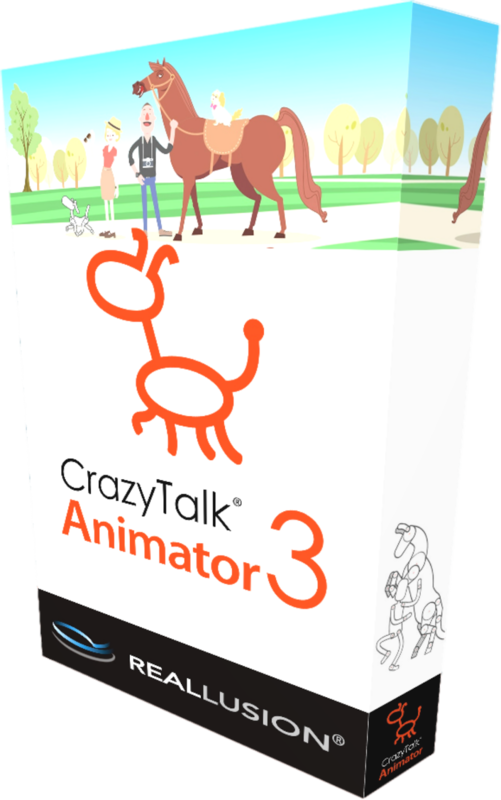 What is CrazyTalk Animator 3? 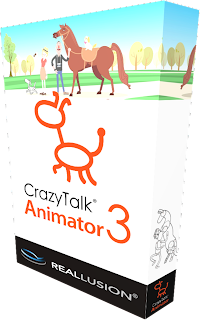 CrazyTalk Animator 3 (CTA3) is designed to be a complete 2D animation composition studio. That is, you'll use external graphic editors like Photoshop, Clip Studio Paint, or CC Animate to create your assets before bringing them into CTA3 to set up your scenes and animate the action. Where it excels is the ease of use and the many time saving features that greatly speed up the animation process when compared with other applications. CTA3 is an evolution of CrazyTalk 8 which in earlier versions was exclusively a 2D animation tool. As such CTA3 includes the same head creation tools for what it calls 'Morph base' heads. Additionally it includes many different types of character rigging tools, and gives you the ability to animate complete character bodies, props, backgrounds, almost anything in 2D really. Unlike CrazyTalk 8 you can include multiple characters in the same scene. My completed animation, created with CTA3 is below. If you would prefer to watch a detailed video of how I created my animation in CrazyTalk Animator 3, I've got you covered below. Otherwise skip to the next heading for a more general overview of the process. border all the way around. As with CrazyTalk 8 the first step is to spend time preparing your graphics in your prefered graphics editor. Anything will do so long as it's capable of saving images as transparent PNGs and, if you intend to use CTA3's templates, as PSD files. 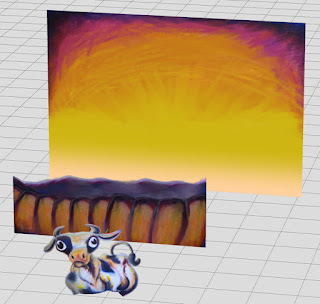 This time I'll not only separate the cow's head and eyes from it's body, I'll also separate the cow's tail, the field behind the cow, and the sky. Everything except the sky (which I could have optionally save as a JPG file) is saved as transparent PNG files. 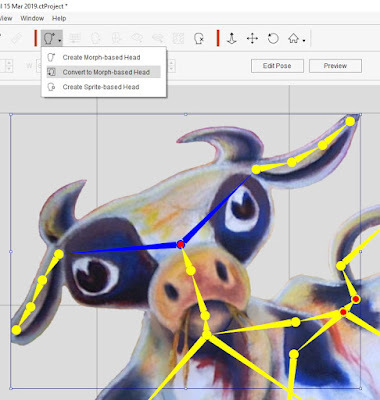 Unlike my CrazyTalk 8 project, this time I rotated my cow's head so it wasn't turned to one side, and I cropped it much closer, leaving a 50 pixel border all the way around it (the border was to try an overcome a problem I was having with the morph based head not properly masking the cow's ears). All other components I cropped right up to their edges. see this character has just three images. 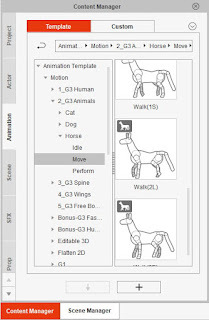 CTA3 Pipeline is sold with bonus PSD file G3 character templates with one specifically for quadrupeds from a side facing angle. While my cow character only has a few sprites (i.e. images) that I could have uploaded into a G3 quadruped dummy template directly in CTA3 (which is how you'll create all your characters if you only have the Pro edition of CTA3) using the PSD templates can save you a lot of time with more complex characters. 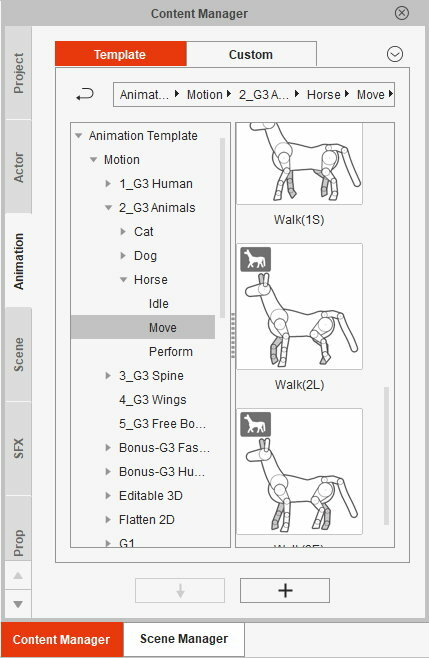 I could also have rigged my character as a 'Freebone' G3 character however, by using the quadruped G3 template my character can be animated with predefined G3 motions for quadrupeds. Whichever way you rig your character you only need to include a single image of your character's head because once you're in CTA3's character composer you'll be converting that image into a morph based head. For a detailed explanation for how to use the PSD templates consult the documentation sold with CTA3 and make use of the many Video Tutorials from the CTA3 Learning Centre. Obviously CTA3 is a much more complex application than CrazyTalk 8 with more to set up if you want to include things like animating your character's body or create a multiplane effect. I won't be able to go into any of it in great detail but I can give you the broad strokes. 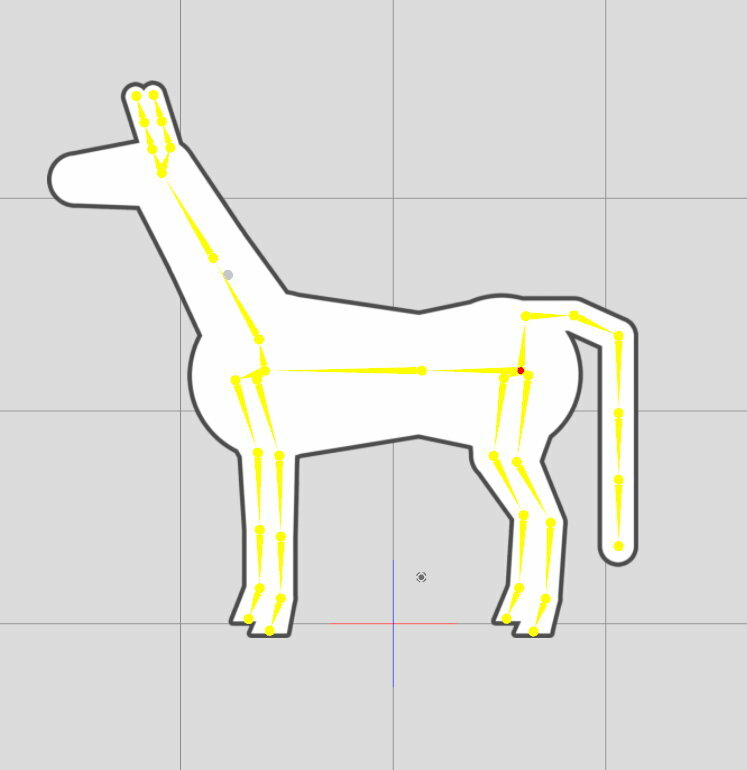 As mentioned earlier I set my cow character up in a G3 quadruped template. This meant rigging my character in CTA was as easy as starting with a standard dummy horse G3 character, going into the character composer and importing my PSD file using the PSD Import Tool. Character done...well almost. Adding the Morph Based Head. 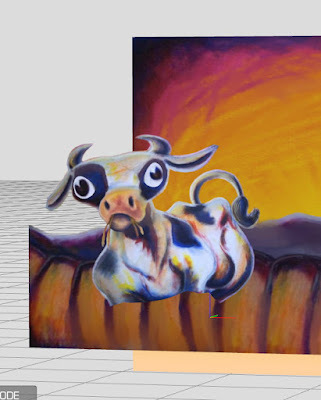 My cow character already has a face image. The next step is to convert this into a Morph based head. 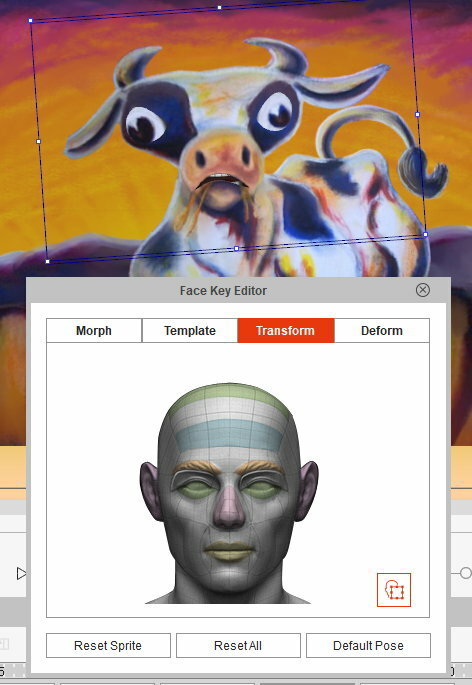 Conveniently there is a 'Convert to Morph-based Head' option right under the Create Head tool. Selecting this will start you through the very same process of rigging the head that I covered in more detail in my previous article Animate Your Artwork with CrazyTalk 8 (Pipeline). Note though, that while the process is the same CTA3's Morph Head creator appears to be more buggy and can give unexpected (and downright inaccurate) previews of how you've rigged your head. Previews can looked scrunched up and wildly distorted but, if you exit the head creator, your character's head will look more how you'd expect. Then if you go back into the editor the preview will look fine until you start making edits and preview again. All of this could be a bug that has been fixed by the time you read this, or it could be unique to my copy. I'm mentioning it just in case the issue occurs for you. My scene as displayed in 3D view. My background I divided into two graphics; the field, and the sky. This was so I could set up a multiplane camera effect on CTA3 Stage Z axis. Each image is imported into CTA3 as a prop and placed from closest to furthest away from the camera. In terms of scale the sky is resized at a much larger scale to the field because it's sitting much further away from the camera. The more distance you put between each item the more parallax effect you'll get when you pan the camera in any direction. My cow character I placed quite far forward at the front (obviously) because it's closest to the camera and, having no legs, the lower body needed to be cropped by the camera frame. There were three main stages in the animation of this project after I had imported my cow's dialogue and let the auto lip sync do its magic (I did tweak this a little but for the most part it did a good job). This was done entirely with pre-animated G3 motions. 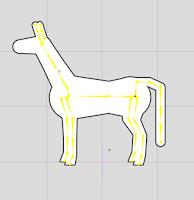 I used a basic looping horse walk for the first few seconds, as the cow walks into shot, followed by a looping idle pose that makes the body sway slightly and causes the tail to flick periodically. I'm a lazy animator (yes, I said it!). I don't enjoy the process of animating as much as I enjoy seeing the finished results so, anything that gets me there quicker is my friend. That's why I love the ability to 'face puppet' character animation in CTA3. 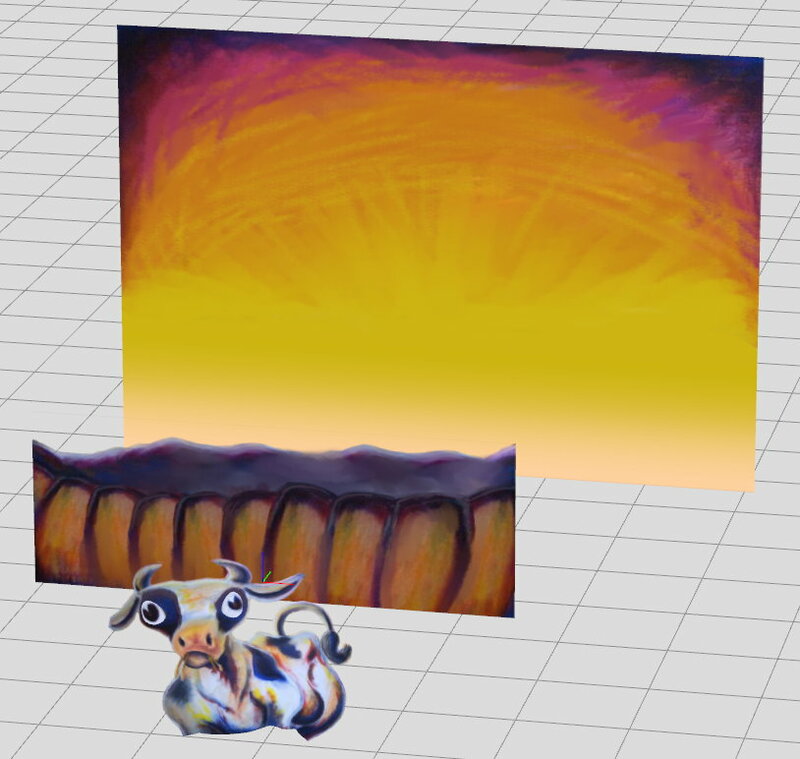 Starting at the beginning of the animation, I opened up the Face Puppet tool, hit record, and moved my cow's head as best I could to match the dialogue and music. I know I could do better with key framing and using the template expressions but for the purpose of a quick demonstration, I love the face puppet tool. you need to animate something quickly. The only thing I couldn't do with the face puppet tool is move my cow's head closer and further away as it moved its neck up and down - something you'd expect from a creature with a longish neck. So I did a second pass using the Face Key Editor and manually key framed the head moving closer and further away. The final step was to animate the camera to pan right at the same time as the cow walked into shot. I had planned a much bigger pan across so it would be more obvious but it didn't look great. The slower shorter pan is barely noticeable unless you're watching for it but I still think it looks better than the camera being totally stationary as the cow walks into shot. Creating the pan only required two key frames; the start and the end points. On top of character voice tracks CTA3 has two sound effect tracks and one music track. My animation uses one voice track and the music track. Prior to animating I synced up my audio with the music in Audacity. I then exported the voice track separately from the music but made sure the length of both files was exactly the same. That way I could just line up the start of the audio file in CTA3's timeline and they'd be perfectly in sync. After all the animation was done, I imported the music track, turned the volume down by 50% because it was a little loud for my vocal... and that was that. 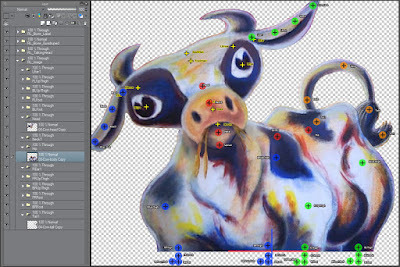 If you would like to step through this process using my cow character graphics, all the image files are available to purchase in my Animation and Video Life website store. Your purchase includes a non exclusive license to use the graphics in your own personal and commercial projects.